The end of summer usually means two things; one, it’s the end of summer and two, it’s time for a road trip. 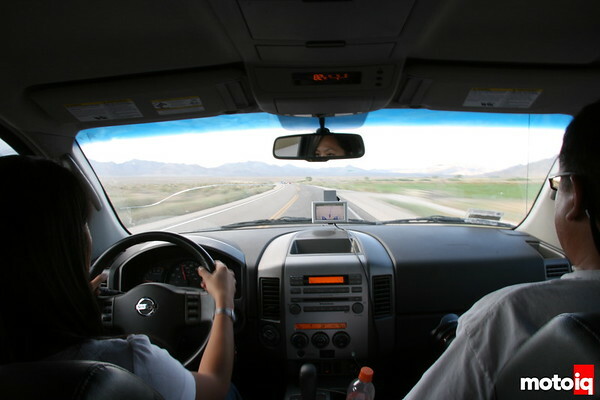 The MotoIQ staff usual tries to have a least one epic road trip automotive adventure during the summer months and this year it was a trip to the country’s greatest open road race, the Silver State Classic in Nevada. The Silver State is a must do for any automotive freak; it’s a 100 mile all out road race across closed highway in Nevada. This seemingly impossible event in litigation-prone America is run by the SSCC, the sanctioning body behind several different legal unlimited speed events in Nevada and Mexico. The race is run on a 90 mile stretch of Nevada 318 between the towns of Lund and Hiko. Highway 318 features 14 mile straightaways and a curvy section of road through a canyon referred to as the Narrows. The record for this run is a hairy average speed of 207.8 mph set in 2000 by Chuck Shafer in a tube framed Chrysler LeBaron, of all things. The highest instantaneous speed is 227 mph set by Rick Doria in a highly modified Corvette. Speeds this high in a production based car with questionable aerodynamics is pretty damn ballsy. These speeds can be pretty dangerous, a few people have pushed the limit in this event and have never returned. Even well equipped teams like the The JUN built Option Magazine 350Z crashed at 217 mph. The race can be run for unlimited speed or in 5 mph brackets from 180 mph to 95 mph. The object of the bracket classes is to stay as close to the bracket speed as possible. Other events held over the 4 days of the event are the Z1Z Speed Stop Challenge which is a Zero to 100 mph to Zero event, the One Mile Speed Shootout and the Half Mile Speed Shootout for top speed in the flying mile and half mile. Somewhere in between all of this stuff there is a car show and a parade through the town of Ely Nevada. Team MotoIQ picked the Bonneville proven Turbo SR20 powered Nissan B12 Sentra owned by Chuck Johnson form our palatial garage as our vehicle of choice for this event. You can read about Chuck’s other adventures with this car here and here. 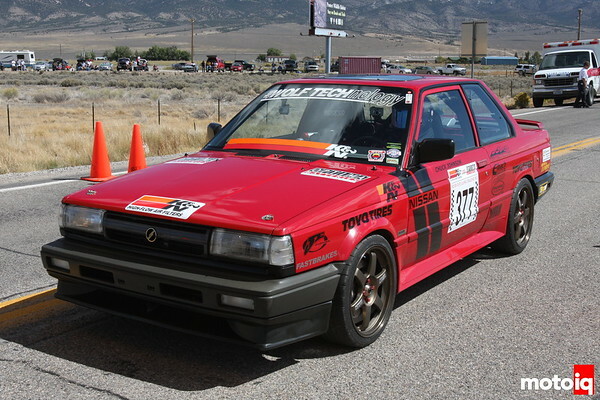 The 1988 Sentra is a family heirloom in the Johnson household and the car is built well for high speed events and has been proven at 160 mph at Bonneville. With Chuck driving and Project Racer Columnists Annie Sam as Navigator, I was relegated to tow truck driver, an important role considering that since the race is a one way deal, someone had to pick up Chuck, Annie and the Racecar.